Archbishop of Port-of-Spain Edward Gilbert, Chief Celebrant at the State funeral for Sir Ellis Clarke brought a chuckle to the proceedings when he told the congregation he was not aware that he was to deliver the homily. TRINIDAD and Tobago yesterday said farewell to its first President Sir Ellis Emmanuel Innocent Clarke, 93, with a full day of services marked by an outpouring of emotion as citizens paid tribute to a man known for his love of country and his faith. HUNDREDS of people lined the streets of Port-of-Spain yesterday from the National Academy for the Performing Arts (NAPA) to the Lapeyrouse Cemetery to pay their final respects to this country’s first president Sir Ellis Clarke, following a State funeral held for him at NAPA. President George Maxwell Richards says the contribution of Sir Ellis Clarke to the birth and development of T&T cannot be erased. YESTERDAY’S state funeral for the late Sir Ellis Emmanuel Innocent Clarke evoked a full range of emotions—from deep sorrow to unbridled pride—at what was a most momentous occasion. Scores of people turned out yesterday to bid farewell to the man who, in addition to being Trinidad and Tobago’s last Governor General and first President, had been largely responsible for the enshrining of crucial rights and freedoms into the nation’s Constitution, Sir Ellis Clarke. 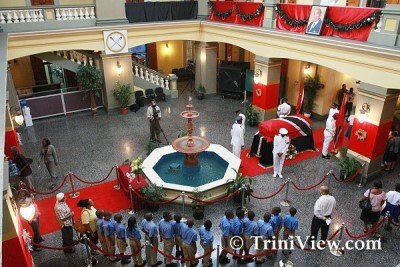 State officials and members of the public view the body of former President of the Republic of Trinidad and Tobago, the late Sir Ellis Clarke, at the Rotunda of the Red House, Abercromby Street, Port of Spain. THE STATE funeral for Sir Ellis Clarke will be held on Friday at the National Academy for the Performing Arts (NAPA) in Port of Spain, a release from the Office of the Prime Minister stated yesterday. Two days after celebrating his 93rd birthday, the first President of Trinidad and Tobago Sir Ellis Clarke has died. 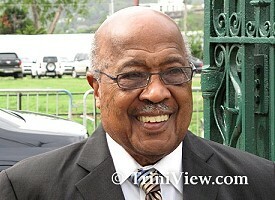 Sir Ellis passed away peacefully last night at 7.15 at his home at 6 Pine Grove, Fairways, Maraval. He never recovered from the massive stroke which he suffered last month. On November 24, Sir Ellis was rushed to Westshore Medical Centre in Cocorite for medical treatment for the ailment. In a statement from the residence last evening, the family said it wished to thank all those who offered prayers and best wishes during his brief illness. Three days after celebrating his 93rd birthday, Trinidad and Tobago’s first President and its first local-born Governor General, Sir Ellis Clarke, died last night at his home in Fairways. Sir Ellis was rushed to the Westshore private hospital on November 24 after suffering from what was described as a massive stroke. He was discharged from the hospital on December 12 and was recovering at his home where he received round-the-clock medical care. He remained active until very recently, attending public functions and even providing a legal opinion on the extradition proceedings of Ishwar Galbaransingh and Steve Ferguson. To mark his birthday, the family held a special lunchtime mass on Monday for Sir Eillis, who was a devout Roman Catholic, at his home. The mass was conducted by Father Garfield Rochard, of the Church of the Assumption, Maraval and in attendance were 15 close relatives. During the mass, special prayers were said for the former President’s recovery. Trinidad and Tobago’s first President, Sir Ellis Clarke, died last night, two days after his 93rd birthday. I was deeply saddened to hear of the passing of Sir Ellis Clarke TC, GCMG, KCMG, CMG, former President of the Republic of Trinidad and Tobago. Sir Ellis, a most outstanding and dedicated patriot, served our country with unswerving commitment. He contributed significantly to laying the foundations on which this country would be built – as diplomat, in the law, as last Governor General of independent Trinidad and Tobago, as architect of our Republican Constitution and as first President of the Republic of Trinidad and Tobago. necessarily bear the stamp of officialdom. As an orator, he was surpassing and, with this extraordinary gift, inspired many by the nuggets ofwisdom which he gave to us, without text, and often, with delightful humour. Sir Ellis represented an era in public affairs and in personal dignity, upholding the best characteristics of what many of us see as the finest of the Trinidad and Tobago quality. Sir Ellis’ late spouse, Lady Ermyntrude, his son, Peter and daughter, Margaret Ann, completed this much respected and well-beloved family. Other members of my family, the staff of the Office as well as of The President’s House, past and present, who were blessed to know and to serve him, join me in conveying to the bereaved family deepest condolences. As Head of State, I express the nation’s gratitude for the service of Ellis Emmanuel Innocent Clarke and its grief at his passing. In tribute to his life, let us all resolve to heed his example. The Office of the President.